I have recently acquired 24' Penn Yan Seabird which has a fiberglass hull and wooden keel. I have spent some 40hrs restoring the topside, deck and varnish which has seem to have been worth the effort. I only have a few more steps to complete before she can be launched. 1.) The last few pieces of wood that makeup the rudder have become separated and are in need of repair. I was thinking that since the wood appears to be in fair condition that it would be possible to epoxy and fiberglass over the end to reinforce the rudder. 2.) I have scraped the hull and have exposed the bare wood of the keel. 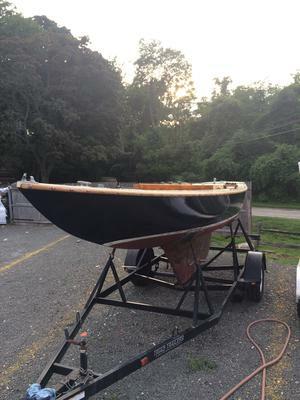 I was wondering the proper procedure/process of preparing the bare wood for bottom paint and the best product/method I should use to fill the seams in the keel. 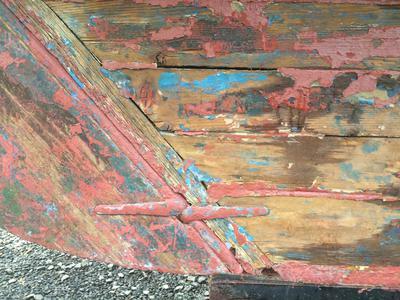 There are several between the planks and larger "holes" where the keel meets the rudder. You have done a wonderful job love the picture. I have been asked to do a 8.9 meter dragon. So if its about the rest of your project I would pull the rudder. This is a fast boat if you add strapping, wrought it in, drag is not what you want. I would pull up on the rudder first to see if the hardware may be at risk of failing. Think g fores, a bottom strike. For me, the rudder off, make a new one. You're not going to like this, drop the ballast and check for rot, you can chop and splice or replace the wood it can't be about money, its just time. This boat is a head turner, got my attention and like mike said, no to glass. You have a great boat, love it, it's like a jaguar. 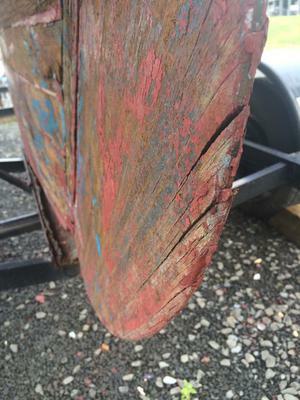 Fiberglass isn’t such a good idea on a wooden boat, it doesn’t allow for movement such as taking up, I'm not even convinced by the "Vaitses" process. 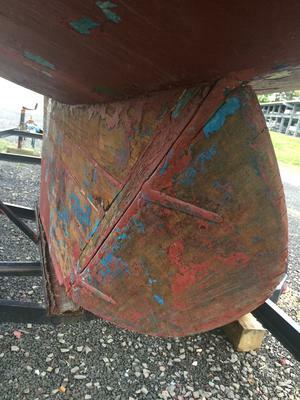 Looks like drying out may have caused the keel seams to have opened, which makes it a good time to re-caulk them, with cotton and a seam compound. They should take up when she's back in the water. I suspect that the rudder planks will have been held together with glue and long drift bolts running through to help keep it from warping (?). For the larger gaps in the rudder, rout them out and glue in splines, the smaller ones you may be able to get away with cleaning out the joints and filling with thickened epoxy. You could also, if you think it necessary, strap it with bronze strips, rabbeted in and through bolted.